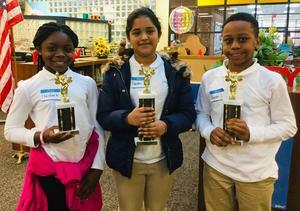 On January 23, parents and students gathered in the Sallas Mahone media center as fourth and fifth-grade classroom winners competed for the SME Spelling Bee title. Congratulations to the following winners who will go on to the district level competition. First place - Nandini Thanki, second place - Braeden Lampkin, and third place - Christan Wright.